The versatility of using the sunscreens when you want! Designed to add beauty and elegance to your home. Contained in a 4″x4″ box and can be mounted on the wall, patio covers or ceiling. Custom made in widths from 2′ to 16′ and vertical projections up to 14′. Available in anodized aluminum, white, beige or dark bronze colors. Can be motorized or manual crank. 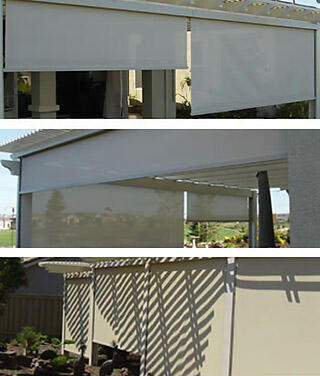 Screen material available in many different colors that are guaranteed against mildew or rot. Helps reduce the glare from the sun, without blocking your view.